Camper trailers have multiple advantages over other types of RV. They are light, easy to tow, and some models can be taken off-road. Beginners and experts alike can appreciate a low-maintenance, low-cost camper trailer. One of the downsides is that camper trailers are almost always smaller than other types of trailer and motorhome. There are plentiful models with great storage capacity. This means that you will have less space to place and store your belongings. You also have to begin practicing organization habits to reduce clutter and mess. Read through our tips to get, and keep, your camper neat and orderly. Before you start getting organized, you need to take stock of everything you have in your camper. The easiest way to do this is with a list. This can be digital or handwritten—the choice is yours. There are many psychological benefits to list-making. Writing lists can help to lower anxiety, provide purpose, and encourage action. There are also several practical reasons why you should take this step. Firstly, listing all of your items will allow you to see what unnecessary things might be taking up space. For example, extra dishware can be a big space-waster. If you are a solo traveler, there is no need to keep a whole set of dishes, bowls, and cups in your camper. Secondly, you can review how you are using your camper space. Are your kitchen cabinets crammed full of non-kitchen items, like tools? Make note of it. This way you know what areas need to be targeted to maximize space. Once your list is complete, you’re ready to start the clearing out process. Unless your camper is already perfectly organized, you will likely want to get rid of some things. Check each item on your list and determine if it’s absolutely necessary to keep it in your camper. An example of essential items is a first aid kit—all vehicles, including RVs, should have one. Other items in this category include toiletries, towels, and kitchen appliances. Keep in mind that, even if something is necessary, you might be able to reduce the quantity or size. As we mentioned earlier, extra dishes and cups can take up a lot of space. If your camper is for family or group vacations, implement rules everyone should follow. There is should be a limit to how many things each person can bring into the camper. Yes, towels are necessary, but does one person really need to bring six towels? An easy way to keep your camper neat long-term is the “one in, one out policy.” This will also encourage you to toss out belongings that have seen better days. This policy is exactly as it sounds: if you bring something in, you should take something out. If you bought a new compact trash can for the kitchen, throw the old one away. Apply this to as many things as you can, including personal belongings. If you have a new winter parka you want to travel with, store your old one at home. New cookware set? Toss the old one out. Storage containers of all types are a handy way to maximize camper space. Using pods, bins, or drawers will keep things organized. Use plastic organizer drawers in the kitchen for little things like tea bags or packets of condiments. This is a better alternative than piling everything up on the counter or stuffing them onto shelves. An added bonus is that you can stack most storage containers on top of one another. You can get creative here by mixing and matching different sized receptacles. Storage containers also keep everything in place, which is important in a camper. For example, you can get cloth bins for clothing, sheets, and bedding. You don’t have to worry about folded clothes or sheets getting rumpled over bumpy terrain. Storage pods are handy space-savers for little items, like cosmetics or toiletries. There are products available that stick to the wall, to hold your toothbrush, cosmetics, and more. In the kitchen, make use of containers for dry food. Cardboard packaging can take up more space than you think, and every inch counts in a camper! Airtight containers will keep your dry goods fresh and easy to access, as well as bug-free. You can double the space in existing cupboards, cabinets, and closets by adding more shelves. 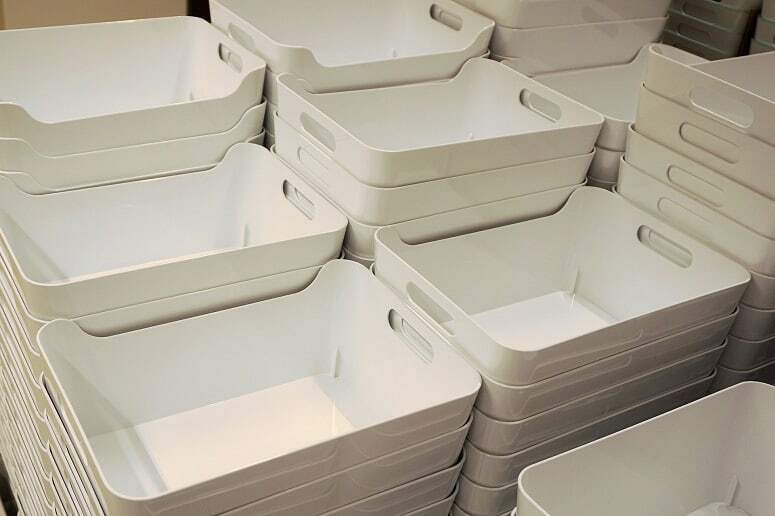 In this way, storage containers for fragile items can be kept separate instead of stacked atop each other. Empty wall space can also be utilized, by putting up a few shelves for extra storage, from the bedroom to the bathroom, or even the inside of doors. You can even set up freestanding shelves on counters or tables. If you are the DIY type, you can build your own shelves to install. If you don’t have the time or inclination to do this, there are pre-made shelves that are simple to set up. Always carefully measure the space where you are planning to install the shelves prior to purchase. Floating shelves are ideal for even the smallest of campers. You can get ones with rails to make sure your spices and other goods stay put when your camper is on the move . These are ideal for walls where you need to remove them when folding away the camper—they just lift off the fittings. If you don’t want to drill holes in your camper walls, you can buy adhesive shelves. There are models that can stick to almost any surface for damage-free storage. Just be aware that these are permanent, so make sure they don’t impede the closing of the camper. Baskets are a great way to add on to shelf space. You can slide wire baskets under existing shelves—no mess or tools required. Awkward items (like long rolls of plastic wrap) that might not fit in a cupboard can go in a basket. Another good use of baskets is to store items that you always need on hand, like Ziploc bags. You can also increase the storage space in your fridge with wire baskets. There are models that are compact enough to fit in mini fridges. Use hammocks instead of bowls for convenient storage of fruits and veggies. These hammocks can be hung under shelves or cabinets, to save counter space. Hooks are extremely affordable items that can be used throughout your RV. They can be useful for many things, beyond simply hanging clothes in your camper. Hooks are discrete and can be screwed in or stuck on almost anywhere in your camper. A hook with powerful suction can be used to hang towels as well as cosmetic racks. You can also get creative. Use multiple hooks on your camper door for things you need whenever you head out, like your sunglasses and keys. Using suction hooks means that you will not have to repair any holes if you decide to sell your camper. You can apply them inside closets and behind doors without worrying about causing any damage. Over-the-door hooks are great, portable, options and will allow hanging of several heavy items, such as wet jackets or umbrellas. The bonus of these is they are easily relocated or removed. Put them on the outside of the door to hang rain-drenched clothing, then indoors once everything is dry. These are two affordable items can be used throughout your RV. Velcro and elastics can change how you organize and store your belongings. There are a few different uses for elastics in your camper. Use elastic cloth to organize the smaller items in your camper. All you need is cardboard backing and a roll of standard elastic. Staple bands of elastic of varying lengths to the cardboard backing, leaving a small pocket in the middle. This is where you will slip your items of choice. There are multiple uses for Velcro inside your RV. As with suction hooks, Velcro is great for storage without causing damage to your RV or furnishings. You can select a brand designed to be used indoors on different surfaces. Caddies can turn your bed into a veritable storage facility. Cloth caddies can be attached around your bed and used to store all your frequently used items. Electronics, sleeping masks, and books can be tucked in discretely and safely. If you have bunk beds in your camper, caddies could be attached to each bunk. Caddies are also ideal for bathrooms which, in camper trailers, can be tiny. A waterproof caddy on the wall is great for holding your shampoo and shower gels. Even if you don’t have a shower in your camper, caddies are portable. All your shower-related products will be in one place. You can purchase narrow caddies to be hung over closet doors for extra internal storage. You can make use of them to store shoes, belts, or other accessories. Cleaning products can also be organized in caddies. Camper kitchens can be magnets for clutter. If you want to make the best use of your kitchen space, kitchenware and appliances should be small. Your camper trailer is not the place for your new full-sized coffee machine—keep things simple. When it comes to appliances, there are a lot of camper-friendly options on the market. For example, collapsible tea-kettles are a great space-saver. Miniature coffee makers are just as functional as their full-sized counterparts, just smaller. Big blenders can be tricky to fit in narrow cabinets. Opt for a handheld blender over a traditional one—it’s efficient and compact. Think about purchasing a nesting bowl set. They typically include everything you need, from strainers to measuring spoons. This type of set will save you storage headaches, as everything fits neatly together. If you are serious about cooking, consider a nesting cookware set, too. Get a set that includes all the basics (pots and pans of different sizes) that can fit neatly into your cabinets. Piling dishes on top of each other is not an effective use of your cabinet or cupboard space. Keeping plates upright is a better option. A dish cradle will keep your plates vertical and can also be used for drying them. For camper trailers, think collapsible. Items that can be folded away after use are ideal for several reasons. Firstly, they don’t permanently occupy valuable living space in your camper. Secondly, foldable or collapsible items are a breeze to store. The benefits of collapsible items can apply to many essentials, such as trash cans. Putting your trash can inside a cabinet may not be an option for everyone. A collapsible trash can be set up inside or outside your camper. When you’re ready to leave, just empty, clean and fold it up. If you are a camping enthusiast, a bucket is likely something you need. 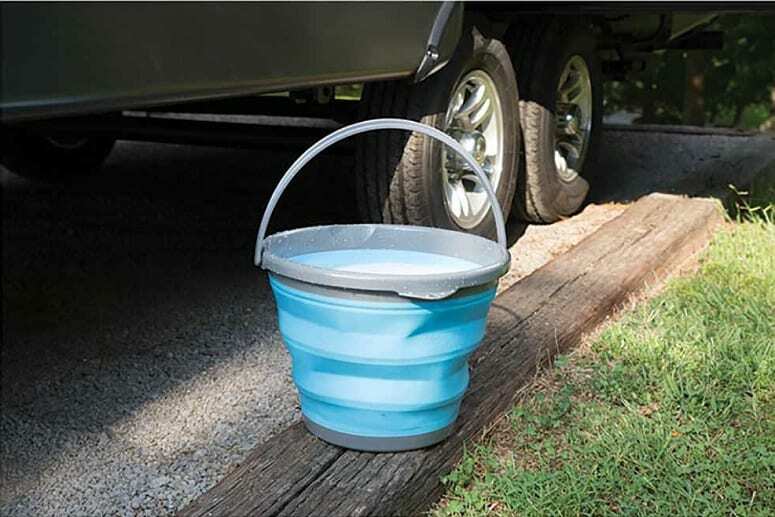 Instead of wasting car or camper space, get a collapsible bucket. Counter space in a camper trailer kitchen is precious. A dish drying rack can take up more of that counter space than you’d like. A collapsible dish drying rack can solve that problem for you. When there are no dishes to dry, fold it up flat and store it away. It may surprise you, but there is a correct way to store clothing and cloth items to maximize space. Knowing what to hang, what to fold, and what to vacuum pack can save you precious storage room. T-shirts, sweatpants, leggings, and sweaters are best kept in storage bins. Don’t hang up articles of clothing unless they absolutely cannot be compressed (like a suit). This will save space, and your clothes will remain tightly packed, even on bumpy roads. The fold-and-roll method is the way to go. Essentially, instead of folding your clothing into flat squares, you roll them up. If done correctly, most types of material will not crease. If you plan to make a long trip with your camper, extra sheets are a necessity. Load up every hanger to capacity—you can loop or clip gloves, scarves, and hats underneath jackets. Get sturdy, durable hangers that can support a good amount of weight without cracking. 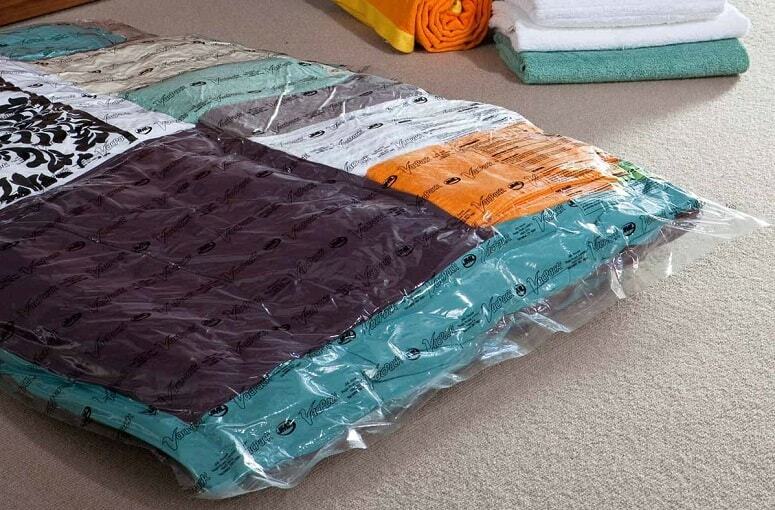 Vacuum sealing is best for extra bedding items that can’t be folded, like pillows and blankets. Invest in reusable bags with a travel hand pump for practicality. Maximizing storage space in a camper involves creativity. There are various items that can be repurposed to help you keep your living space organized. 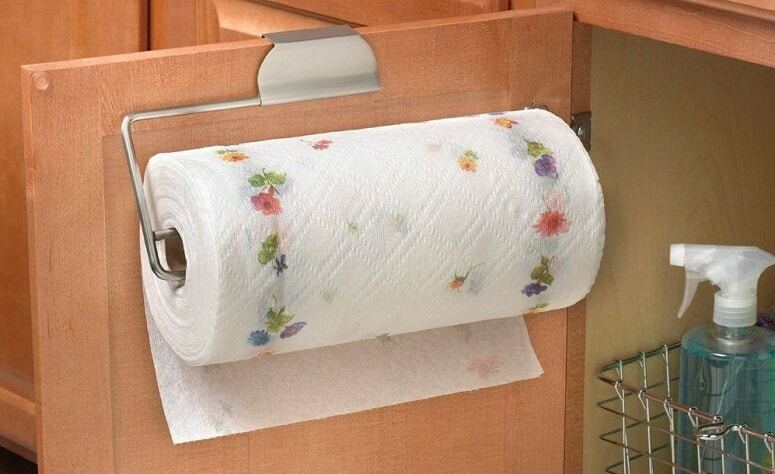 Paper towel holders are a must-have for camper trailers. Aside from paper towels, you can use them for garbage bag rolls or plastic wrap. If you want to preserve resale value, choose a freestanding holder, or one that fits over a cabinet door. No drilling or screws will be required. A hanging shoe rack can be used for more than just shoes. Hang one in the closet to store rolled up towels, socks, or accessories. Cloth ones are best as they can be squeezed a little if needed. Magazine racks can hold all sorts of things in your RV living area. Use them for spare napkins, chargers, flashlights, and more. You can get a floor-to-ceiling rack for all your odds and ends. Some old containers and boxes can be reused for storage. Use large plastic bottles to store plastic bags. Stuff bags in through the top and cut a small hole in the bottom to pull them out. 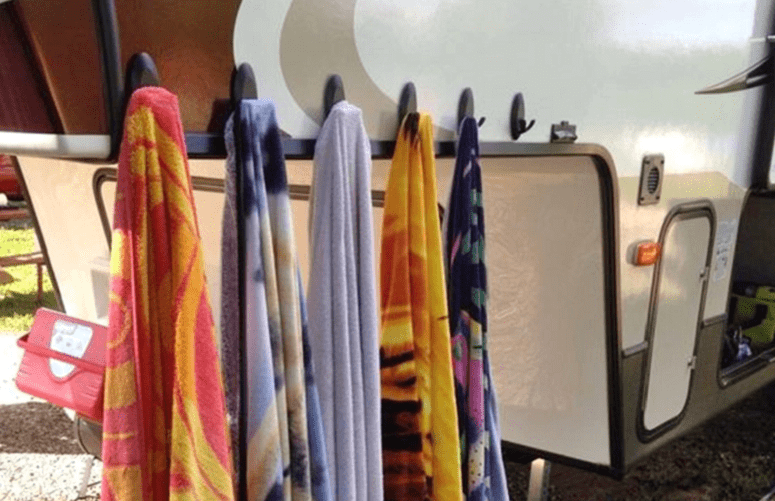 Towel racks can help solve a camper owner’s storage nightmare: pot lids. Even with nesting cookware, you may still have to store lids separately. Attach a towel rod to the back of a kitchen cabinet, and you should be set. Most lids will be supported by the rack without slipping through. You might need to attach small rods to multiple cabinets. Tools are definitely required items for an RV owner. If something happens to your camper on the road, you need to be prepared. Preparation involves knowing where everything you need is in the event something goes wrong. Other supplies, such as screws, bolts, and adhesives, should be kept on hand. If a cupboard door comes loose at some point during your trip, you want to be able to fix it. Glue and duct tape can be used to patch up leaks temporarily. You also need tools for general maintenance of your camper trailer. One example is a wrench—you have to make sure your tow hitch is tight. However, these supplies can take up space, especially if they are scattered about. If you already have a collection of tools, invest in a good toolbox. It’s always better to keep all your maintenance-related items in one place. Not only is this more accessible, but safer if you bring children in your camper. If you want to start afresh, buy a full toolkit. These are not cheap, but they are long-term investments that every RV owner should have. Choose a compact mechanic’s tool kit with all the necessities. You can take advantage of it for extra storage. The inside of your car as well as the roof and trunk can hold more than you might expect. Before a trip, take the same approach to clearing out your car as with your camper. Get rid of any unnecessary items or mess taking up space. Keep your RV toolkit in the trunk of your car. Do the same for other bulky supplies such as step ladders or vacuum sealed blankets. Surfboards, kayaks, and bicycles can be strapped to the roof of most vehicles. Use a trunk organizer to keep all of your belongings neatly organized. You can also fill storage bins, which can then be used inside your camper when you arrive at your destination. A backseat organizer is great to store items that can clutter up your camper living space. Unlike suitcases or boxes, they will not take up passenger space. In larger vehicles with multiple seat rows, you get a lot of extra storage space. Store children’s toys, BBQ supplies, or anything else you have trouble finding space for in your camper. Whether you just bought your first camper or have owned one for years, I hope you learned something new. At least some of these tips and techniques will help you get your camper organized. I know that choosing a camper trailer over other types of RV means skimping on space. Still, there’s no reason to have to deal with a cramped, over-stuffed camper on the road. It is possible bring along everything you need without impacting your living space. A disorganized camper can make an otherwise enjoyable trip more frustrating than it should be. You should know where everything is and be able to access it without going through an ordeal. 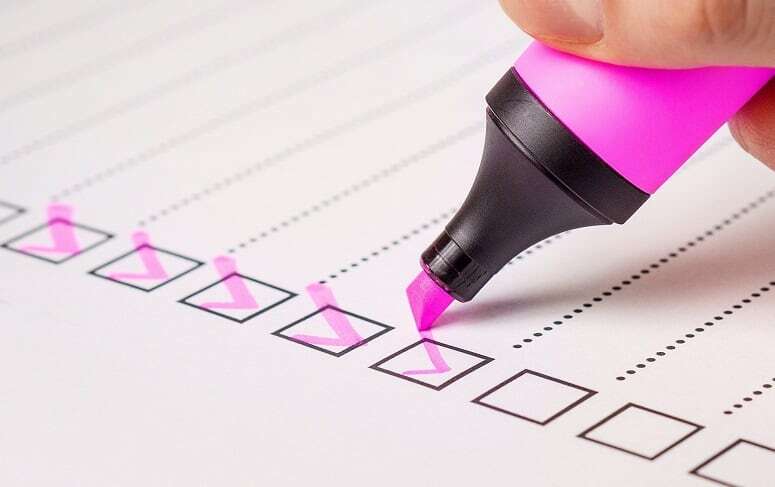 Do you have any tips to add to this list? How do you keep your camper organized? Share the article with fellow camper owners if it helped you achieve a neat and functional trailer!